It was too good to be true. 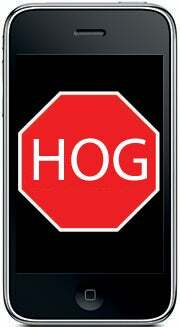 Last week Verizon Wireless had good news for data hogs when it said the iPhone 4 will be sold with unlimited data plans for a limited time. On Thursday we now know there's a catch. If you're in the top 5 percent of Verizon's data users, you'll be throttled. Verizon announced the change in a note on its Website (PDF link). Once you've crossed the 5 percent threshold, Verizon will reduce your data speeds "periodically ... at locations and times of peak demand" through the next billing cycle. I suppose it's a good thing that Verizon is even bothering to publish this information. The carrier certainly doesn't have to, at least until the Federal Communications Commission's net neutrality rules take effect. Those rules allow wireless carriers to manage bandwidth as they please, as long as they're transparent about it. · What's the typical amount of data that a smartphone user consumes, and how much data do the top five percent typically consume? · How severely will data speeds change for the top five percent? · Will customers be notified when they are approaching or have crossed the threshold? · And what's the breakdown in that five percent between smartphones, Mi-Fis and USB sticks? Without more specifics, the subtext is clear: Everyone who consumes a significant amount of mobile data should be worried about getting throttled and should keep their usage in check, because you never know when you'll be part of that five percent. This is precisely the consumer attitude that net neutrality is intended to defeat.